Have I told you how much I love fall? Enjoying the cold, crisp days. Fresh apples from the orchard. Corn mazes, and pumpkin carving. What's not to love? 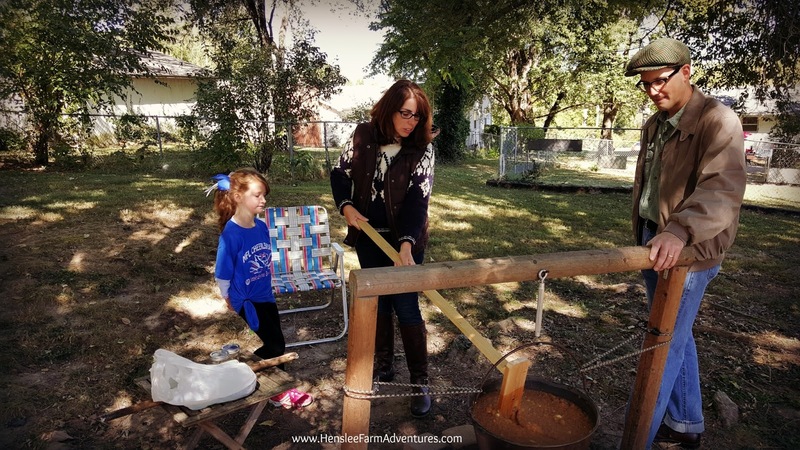 Another reason I love the fall is due to a family tradition that was started by my niece and her husband. Actually it is a family tradition that his family started and they decided to carry it on. 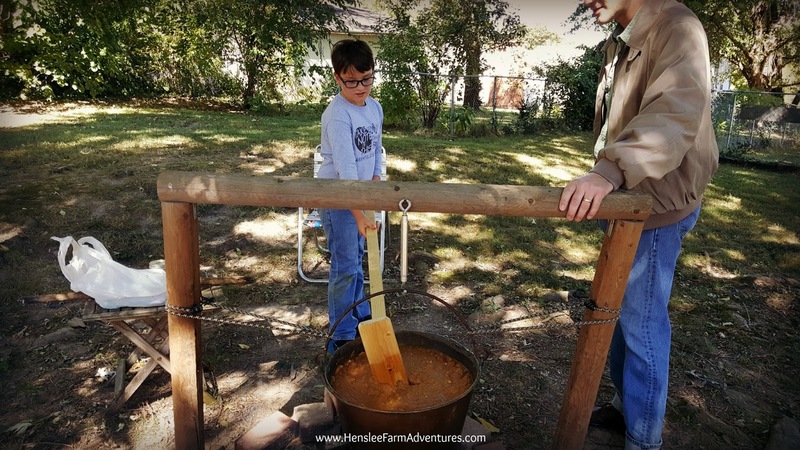 Making old-fashioned apple butter! 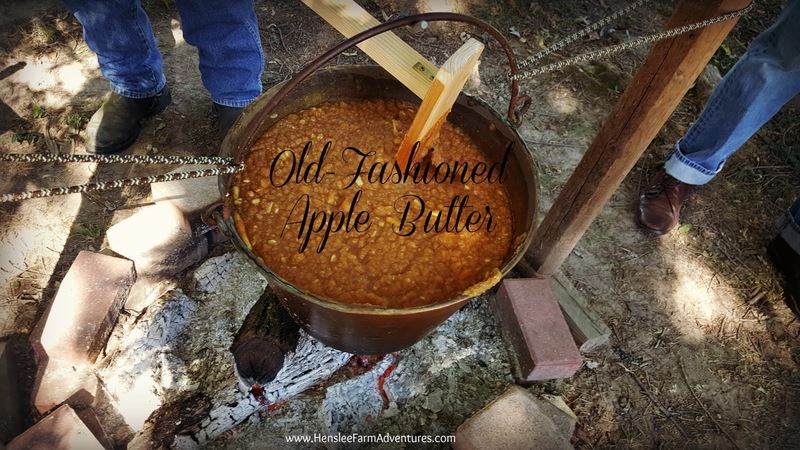 When I talk about making old-fashioned apple butter, I am not talking about using an old recipe, but about the process of making the apple butter. We make it outside, over an open fire, in a big kettle. I have a picture in my head about how pioneers must have done something very similar. It is a true group effort. I wouldn't want to try and stir this all by myself. It does get tiring after a while. And before the apples break completely down, it can be quite hard to stir. 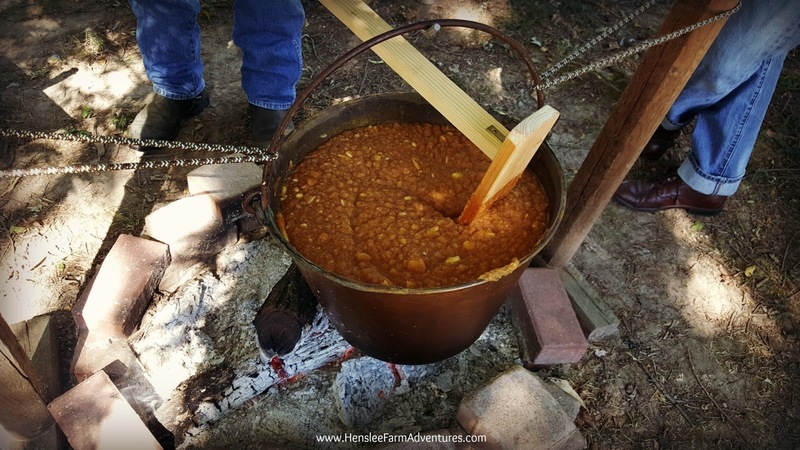 While the apple butter is cooking, we eat a potluck lunch, and continue visiting with each other. At the end of the day, when the apple butter is cooked, we each get to take home a pint jar to enjoy. I talked to one of the men that was there and we discussed how people used to come together to help each other out. They would have a big barn raising, or help each other butcher, make soap, etc. It was a way to lighten the load of work that was very taxing. For us in this process, we helped each other out by taking turns to stir to make the process easier. To the pioneers this was their social time. To be honest, it is my kind of social time as well! It is a great way to pass down the traditions of the old ways of doing things. To be able to pass down these types of traditions to our children is the whole reason why we moved to the country and started our farm in the first place! We wanted our children to learn the "old" ways of doing things. When it comes to a recipe, our family doesn't have one written down for the apple butter. Each year it is slightly different, and each year it keeps getting better. 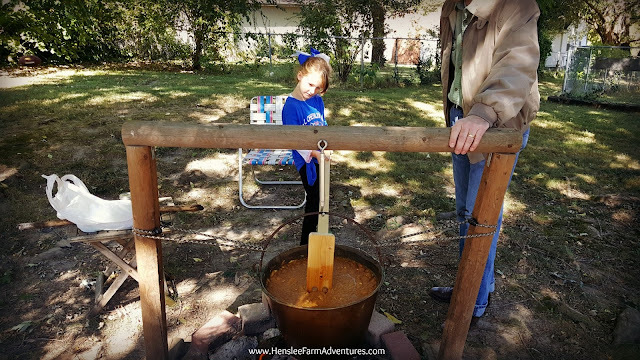 I can tell you that my niece uses apples from a local orchard, apple cider for the liquid to help break the apples down, and spices which consists of sugar, cinnamon, and cloves. I will tell you my niece's secret to making the apple butter over the fire. She starts it on her stove first and then puts some of the apples in the blender. To be honest, if we had to cook down the apples from slices, it would take all day! This helps to hurry things up a bit, which I can't blame her for doing. Once it goes into the pot, it simmers for several hours before its ready to be eaten. I always enjoy these times. 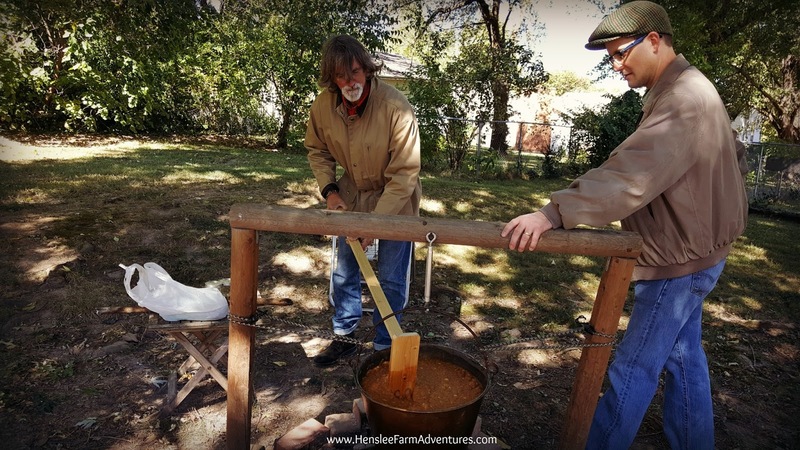 I love creating new family traditions and continuing on the traditions of our ancestors. I hope to be making apple butter with my family and friends for many more years to come! Let me know in the comments below what types of traditions your family has.